For the first time in a year, the price of BTC has positively crossed two important technical hurdles. On April 2, 2019 the closing price of BTC exceeded its 200-day MVA. 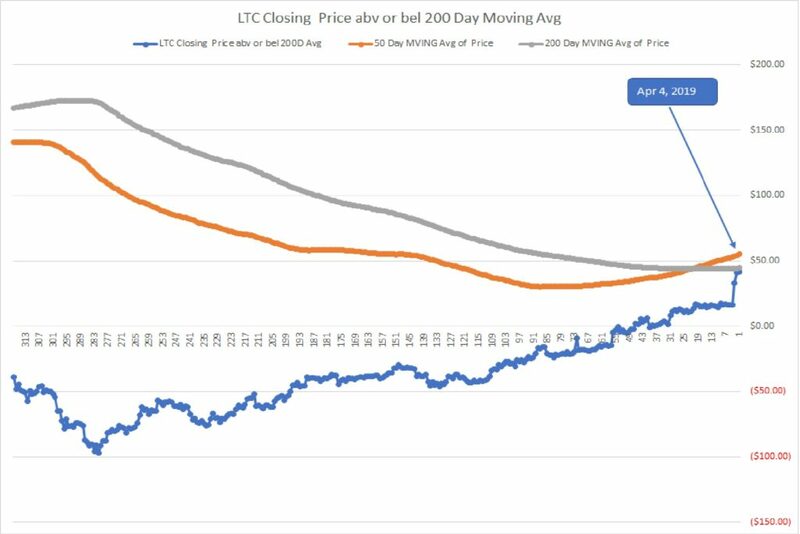 This was preceded by LTC and ETH doing the same (LTC began the recovery process crossing its 200-day MVA back on February 18, 2019). The second important positive cross is occurring today, as the 50-day MVA price of BTC has just exceeded the 200-day MVA price. This is called the golden-cross, as it portends higher prices in the future. Beyond, these “Big Three”, the overall constructive price performance over the past eight weeks of the general crypto-market is even more positive. The percentage price increase of Alt-tokens in the market is higher than the price rise in BTC, ETH, and LTC. 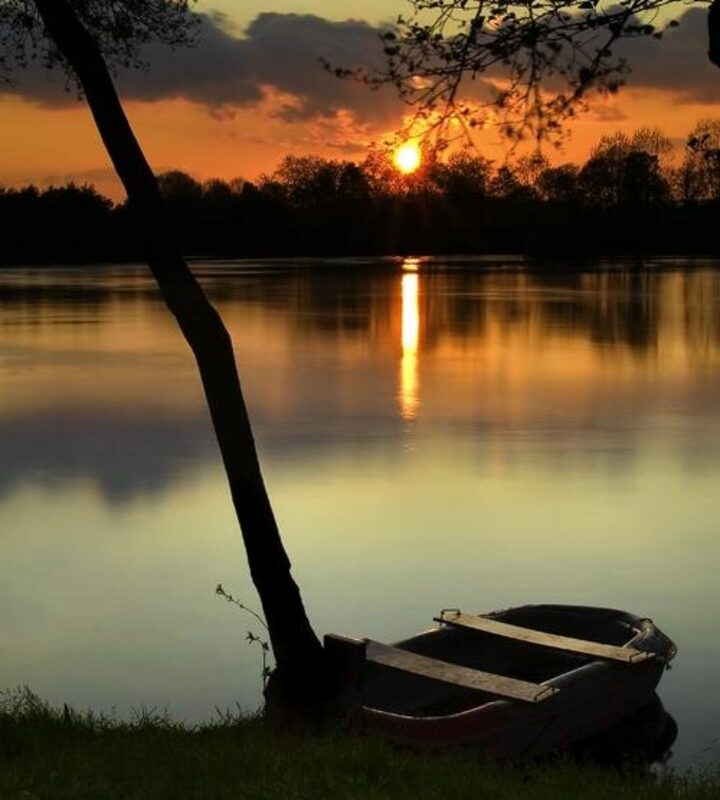 Add in higher volumes, and the crypto-market is behaving in a very constructive manner, as accumulation is once again rising. The named entities or Blockchains set forth below do not represent recommendations to purchase or in any way reflect investment advice. One of the key variables that is critical for deciding to invest is missing. That variable is the current valuation of each token or asset vs the overall market, and a reasoned forecast of future performance vs the market. What is presented below attempts to inform and to encourage research, to learn about each, and to come to an opinion of whether any of them or all of them strike you as being an important participant in the future development of digital asset platforms. The infrastructure build within the Blockchain world is young and filled with new ideas. Some of the entrepreneurs will fail but some will succeed and become the next Google, or Facebook, or Microsoft. As I research and seek out the winners that lay among the ideas that will never mature, my enthusiasm and belief in the Blockchain technology platform only grows. There are real winners emerging. will be the first SEC approved security token. It has filed a $50 million Registration Statement with the Securities and Exchange Commission to sell security tokens to the public. Their founders include PHDs from Princeton University, and they have developed, with $50 million of backing from Venture Capital entities, a comprehensive blockchain platform and web browser that supports contracts and an array of decentralized APPS (applications) that are business and consumer focused. is UK based. Their management team are technologists from the computer security world. They have developed a software licensing platform for business that enables businesses on one blockchain platform to migrate to another blockchain with ease and simplicity. They have designed their platform with banking and oil & gas corporate clients as initial targets. is a Singapore based blockchain. They have an inter-operable platform across blockchains with a focus on the gaming industry and decentralized APPS. They utilize a 150 Node platform in a proof of voting stake environment. Staking rewards on an annual basis exceed 10%. is based out of the Grand Cayman Islands. It has a close connection to Cornell University. Contracts within the blockchain world need to validate that conditions are met to execute the provisions of the contract. ChainLink provides the bridge to data resources that reside outside the blockchain that are critical verification sources. Think of a music sale that triggers within a smart contract payment to all parties at time of sale (artist, writer, producer, etc). This smart contract must link to a validated external source to verify the sale took place. ChainLink provides that connection. is a South Korean based company. They are part of the new Samsung S10 phone release, providing a game based blockchain platform for mobile gaming. ENJIN’s game platform has over 20 million users. is a UK based company. Their co-founder developed Voice over Internet Protocol in the 1990s, and has now built the platform to move money over the internet instantaneously through a banking platform for crypto-assets. They accept crypto-deposits and pay interest on those deposits, and they make loans in both crypto and fiat currencies. 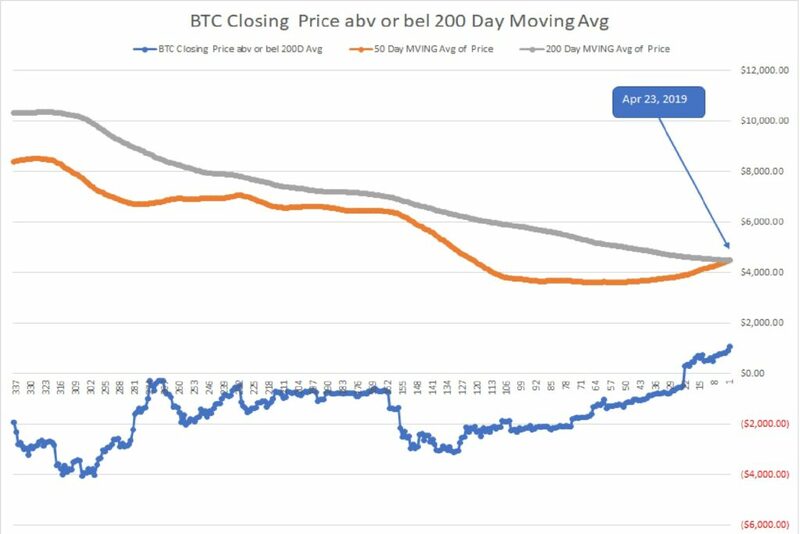 Over the last 4 days the BTC closing price has exceeded the 200 day MVA for the first time in a year. The MVA price is $4,598 which is now support for the current price. Next stop is the cross of 50 day MVA over 200 day MVA. They are $600 apart with the 50 Day trending up, having closed the gap that existed in June 2018 of $2,500. Step one is done, with the current price above the 200 day MVA. Now we anticipate the 50 and 200 Day cross. Strength begets Strength. This week, as of Thursday 11:00 AM EST, has seen a significant increase in crypto-assets, including currencies and blockchain platforms. The combination of double digit price increases with very high volume represents a strong positive for the market, as the movement reflects strength and a deepening participation in ownership. I have previously noted that the strength in LiteCoin was something to watch closely. It led the market as the first CC to have its daily price cross the 200 Day Moving Average of Price (this occurred on February 18, 2019). It continued to strengthen as I added to my position, anticipating it would continue to rise and challenge the the cross-over point where the 50 Day Moving Average of Price would cross and move above the 200 Day Moving Average. The cross occurred on March 16, 2019 at a LiteCoin price of $58.13 per coin. Today the price of LiteCoin is $86.33. The current charts of LiteCoin and Ethereum are below. It is time to pay close attention to Ethereum. 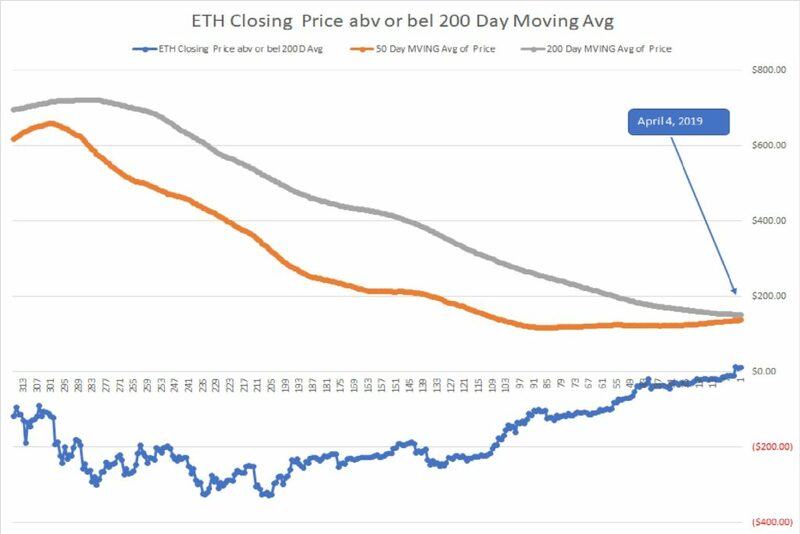 On April 2,2019 its closing price exceeded the 200 Day Moving Average at a price of $141. Today its price is $161.29. It is tracking toward the cross-over of the 50 day and 200 day MVAs. The spread between the two moving averages is currently $13.42. I expect ETH to move higher to challenge that cross-over point. If it breaks above that point, it will likely continue to advance on strength.